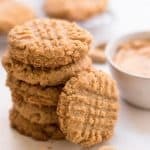 Keto Cookies that are not only healthy but very easy to make and so oh so good! In a mixer, beat together the peanut butter and granulated erythritol until creamy. Add in the egg, almond flour and salt. Mix until combined and a dough forms. Chill dough in the freezer for 15 minutes. Use 1 1/2 inch cookie scooper to make 12 evenly size balls and place them on the prepared pan. Use a fork to press them down.